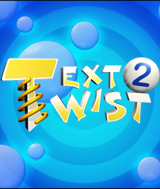 Twist again with TextTwist® 2, the incredible sequel to one of the most popular word games of all time. Shuffle letters to form words in three all-new game modes and two of your favorites. Find the word that uses all of the letters as fast as you can in Lightning mode, complete a crossword puzzle using a limited number of letters in Crossword mode, or try the new daily challenge in Word of the Day mode featuring a new group of letters every day. For classic twisting fun try your hand at the original Timed and Untimed modes. Super TextTwist revolutionized casual word games. Now, TextTwist® 2 takes it to the next level. Featuring 25,000 words to find, amazing new graphics, and nearly endless family fun, TextTwist® 2 is a must-have for word game fans. Comments: Great, challenging, word game!